U.S. And China Move Toward Ending Tariffs On High-Tech Gear : The Two-Way The existing tariff system, which adds as much as 25 percent to the cost of American high-tech exports, covers more than $4 trillion in annual trade, the White House says. An international tariff on high-tech goods could be rewritten, thanks to negotiations in China. 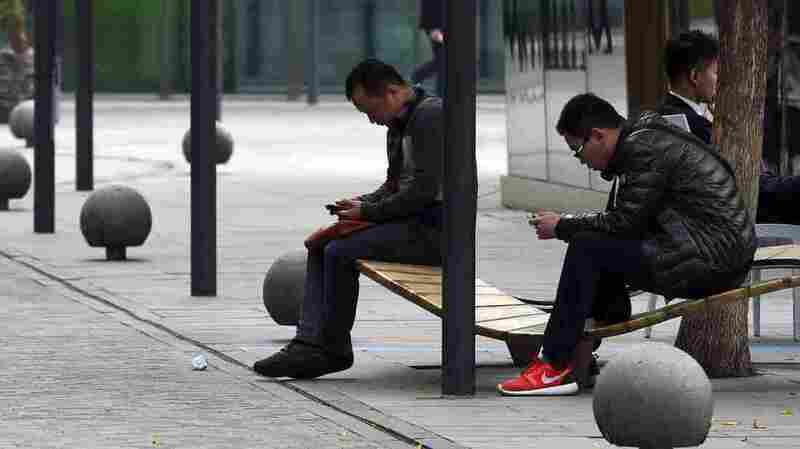 Here, men use smartphones in Beijing last month, days after Apple released its iPhone 6 in the Chinese market. A tariff system that adds as much as 25 percent to the cost of American high-tech products could be on the way out, thanks to negotiations at the Asia-Pacific Economic Cooperation summit in China. President Obama announced the new progress Tuesday. The development could speed the adoption of a new agreement by the World Trade Organization. The current tariff system has been in place for nearly 18 years and now applies to more than $4 trillion in annual global trade, U.S. officials say. "Negotiators have been working for the last two years to update what's known as the Information Technology Agreement, or ITA, but for much of that period talks were stalled. U.S. Trade Representative Michael Froman says a breakthrough came last night, here in Beijing on the sidelines of the Asia-Pacific economic summit.
" 'So it's fitting that we're here with our APEC colleagues to share the news that the United States and China have reached an understanding on the ITA that we hope will contribute to a rapid conclusion of the broader negotiations in Geneva. We think that's good news.' "
The new approach would phase out tariffs on devices that were far from the public market when the current ITA was shaped. Its adoption would require the support of dozens of other countries in addition to China and the United States. In a release about today's news, the White House says more than 200 tariffs would be eliminated, including those that cover medical equipment, GPS devices, video game consoles and computer software. "We already export over $2 billion of high-tech, high-end semiconductors, even with 25 percent tariffs," Froman says. "Eliminating those tariffs will obviously expand that trade significantly. It's an area where we have a comparative advantage, and where we can support a lot of good, well-paying American jobs."